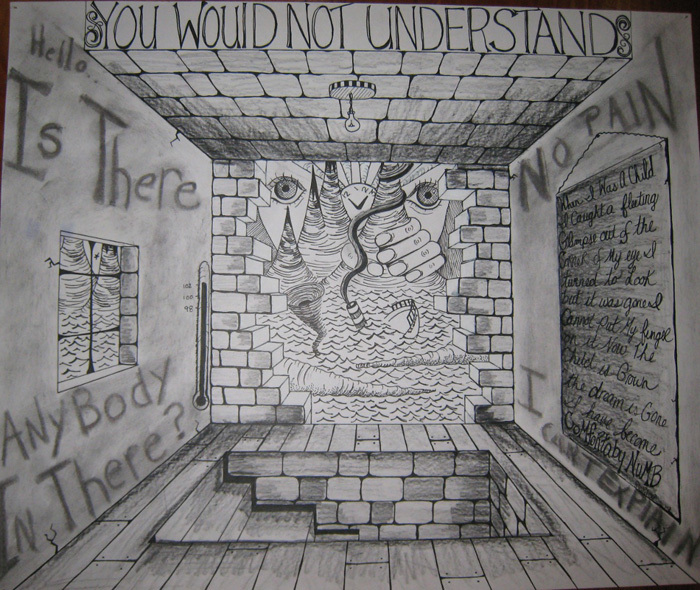 A drawing from high school about Pink Floyd’s Comfortably Numb. The words, You would not understand, really resonated with me. Whenever I’m really depressed I have a go to “soundtrack” and that record is Pink Floyd’s The Wall. I think there are several reasons why The Wall hits a nerve for me. For one thing, it came into my life at the right time, the last year or two of High School and I listened to it on repeat constantly. In fact, now that I really think about it, this CD/Record was actually a tape for me at first that someone had copied from the CD. I didn’t buy the actual CD until later. High School was the right time for me to be introduced to Pink because both High School and college were a pretty depressing time in my life. I had no self-confidence and there were lots of situations with guys that I didn’t understand. I felt horrible. I felt like I wasn’t good enough or attractive enough, and of course due to my panic attacks and anxiety, I felt like I was crazy. How was I supposed to overcome that black stain? Pink Floyd, therefore, was my balm. I’d listen to that CD and think, someone else understands suffering. Someone else understands being mentally fucked. It was like wallowing for me and I can remember listening to that CD in my room while drawing or writing in my journal. Those were the scribbled entries and abstract charcoal drawings that were my therapy and The Wall was the soundtrack wailing in the background. It was like that record represented both anger, rage, depression , the need to escape through drugs and alcohol, even just trying to grow up, trying to understand how you got so fucked up. These were all the things that I was going through. And it didn’t matter that it had come out before I was born. It was universal. It was epic. I still think so to this day. My depression episodes are never as long now as they once were, but every now and then I’ll put on Pink Floyd and let the CD repeat over and over again in the car as I drive to and from work. And I wallow in how horrible I feel. But I know I’m not alone. I’m glad The Wall found me. subject, it might not be a taboo matter but generally folks don’t talk about these issues. To the next! All the best! !